Millions of Americans suffer from sleep disorders, and this can be debilitating, adversely affecting our work, relationships, and health. It’s no secret that insomnia and restless nights plague many of us. Technology can be a hindrance to a good night’s sleep, due to information overload, and devices that emit blue light and rob us of our melatonin. But technology can be helpful, too. Many gadgets on the market help solve sleeplessness. Here’s a rundown of some of the most popular ones. There are dozens of apps available for you to download to your phone or tablet to help you get a better night’s sleep. Here are a few of the top downloads. Sleep Cycle. This popular app tracks your sleep cycle during the night and only wakes you in your lightest sleep. It also stores your data so you can see your sleep cycle and make changes with the tips from the app to get a better night’s rest. Sleepmaker Rain. One of many white noise generating apps, Sleepmaker Rain uses real rain sounds to create soothing white noise. Calm. Calm is one of the most downloaded meditation apps on the market. It has guided sessions lulling you to sleep and helps with anxiety and stress. A pillow that is aging, too soft, or made of the wrong material can be detrimental to a good night’s rest. There are some innovative pillows available designed to help us get a better night’s sleep. If you suffer from excessive sweating during the night, these pillows can help keep your head cool. They are essentially filled with tiny “beads” that absorb heat leaving your face and head cool for a fantastic night of slumber. Designed for specific positioned sleepers, these pillows are shaped so stomach, back, or side sleepers can get the ultimate rest. Water pillows can be customized to a person’s preference when it comes to support and density. They are an excellent option for those experiencing neck pain. While it really comes down to personal preference, a few mattresses have received fantastic customer reviews. The Amerisleep AS3 has been rated highly by the Federal Drug Administration (FDA) as providing a more restful sleep with its memory foam topper. The Tempur-Cloud Supreme Breeze received extremely high customer reviews on the Tempur-Pedic website, with 4.5/5 stars from over 500 customers. It’s a five-layer mattress with a cooling cover, and one of the most breathable mattresses available. The Casper mattress is a bed-in-a-box, like the Amerisleep brand. Bed-in-a-box mattresses are growing in popularity for many shoppers, as they typically allow you to have a 100-day trial of the mattress. The Casper was rated the top mattress by Consumer Reports, which surveys thousands of subscribers to receive its ratings. For those who snore, there are several excellent over-the-counter anti-snoring aids available. It may take time trial and error to find one or a combination that works for your specific situation. These simple devices can be combined with an anti-snoring pillow, a wearable, an app, essential oils and many more sleeping aids to help you with your snoring condition and get a good night’s sleep. If you don’t enjoy the blue screen of your phone or tablet and want to eliminate it, there are several headbands on the market that to fit comfortably on your head while you fall asleep. The Muse headband is one, which measures your brain activity with sensors and plays a meditation session to help you fall asleep. 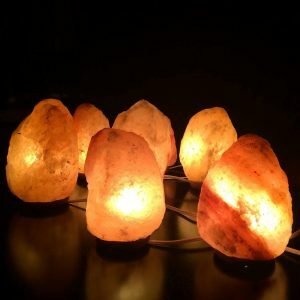 These soothing lamps emit a soft, warm glow, by hollowing out a chunk of Himalayan salt and placing a bulb inside. The salt’s water-absorbing properties help purify the air so you can breathe easier too! Sleep masks are hitting the market in a big way, and Neuroon Open is leading the way. This intelligent sleep mask blocks out light and uses a simulated sunrise to wake you naturally. It measures your sleep activity through the Neuroon app. It also allows you to indulge in 20 minutes of light-spectrum meditation therapy to readjust your biorhythms. The Sleep With Me Podcast is billed as a “lulling, droning, boring bedtime story to distract your racing mind,” and is designed to help you fall asleep. It can be downloaded at iTunes or for Android, and episodes of the Podcast can be found on YouTube. Some may require just one of these gadgets or a combination to fall asleep. But it’s great to know there are so many options to help us get what we all desire – a good night’s rest. Is Snoring Causing You to Gain Weight?